When architecture comes upon painting and sculpture, and together flirt with the light, the colour and the sea, then the result is Ikastikies.Ikastikies is a uniquely modern reinterpretation of the architectural tradition of Santorini island.The Suites are marked by elegantly designed lines, minimalist style and simple luxury. The Ikastikies complex keeps the front seat for you at the most central part of the Caldera amphitheater in Firostefani (for a special accommodation play). 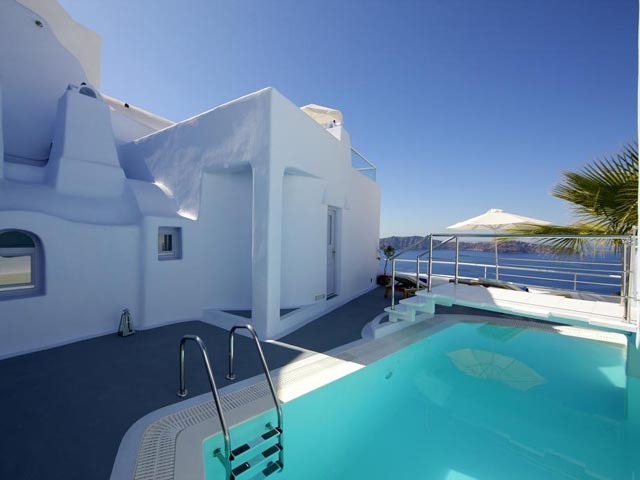 Ikastikies Luxury Suites are located at one of the most beautiful spots in Santorini, Firostefani. The village lies between Fira and Imerovigli and offers magnificent views of the Caldera and the sunset.Following the traditional architecture of Cyclades, it is characterized by narrow cobblestone paths, whitewashed houses and of course the endless volcano view. Ostria Suite is suitable for 2 persons. It consists of a sitting area, a kitchen, bathroom and a double bedded bedroom. Ostria Suite has an interior staircase leading to the hotel veranda with a unique view. Rosaki is a maisonette suitable for 2 persons. It consists of a sitting area, kitchen, bathroom and a loft bedroom with double bed. 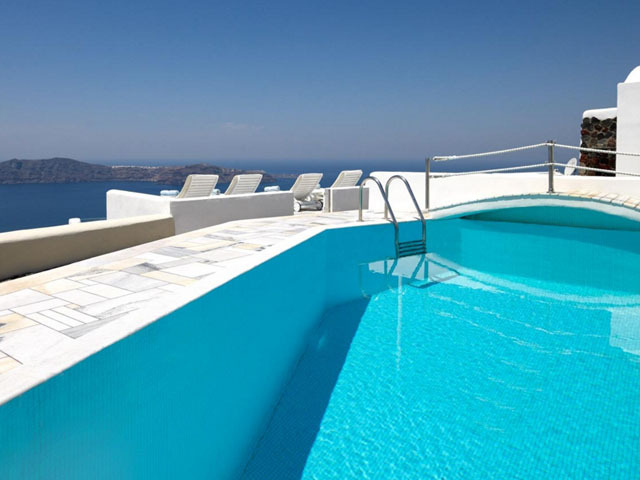 The Suite has a private balcony with magnificent caldera view. Rosaki Suite is tastefully decorated with fine pieces of art and furnishing. Rosa is a cave-house Suite equipped with all modern comforts. It can easily accommodate up to 4 persons. The Suite consists of a sitting area, kitchen and 2 bedrooms, one of which is in the loft. Rosa Suite is tastefully decorated with fine pieces of art and furnishing. 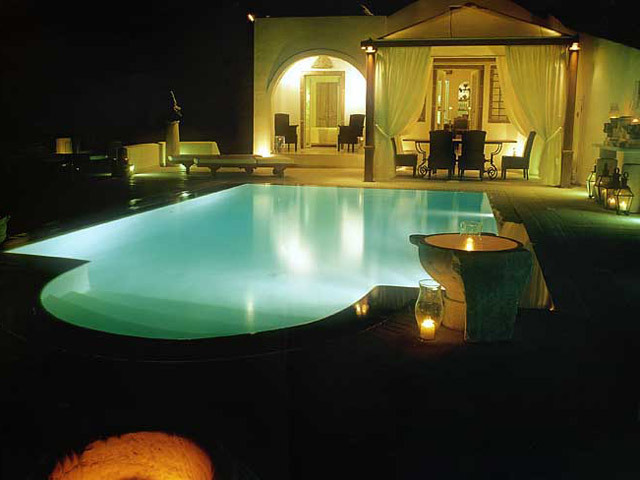 The Spilia Suite offers guests all modern comforts making your stay here memorable. It covers a whole complex level giving the sense of a private house. 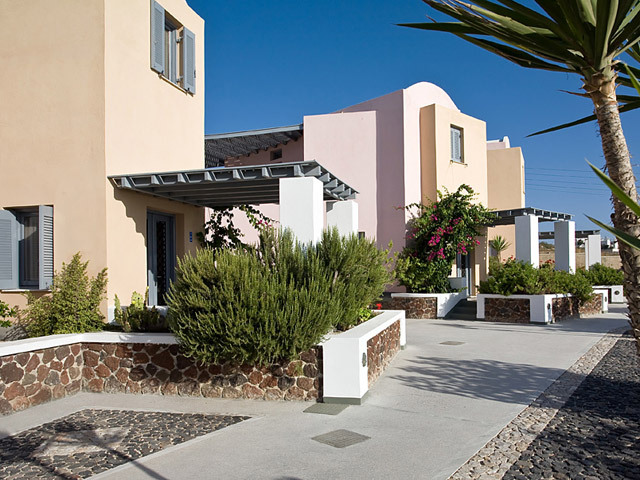 It consists of a spacious sitting area, 2 bedrooms (with double beds), 2 bathrooms and kiitchen. The Suite is painted in pale colours and decorated with genuine pieces of art. It can easily accommodate up to 4 persons. Breakfast is served in your Suite, while dinner can also be served in your suite upon request.